TGI Friday’s Potato Skins are delicious. 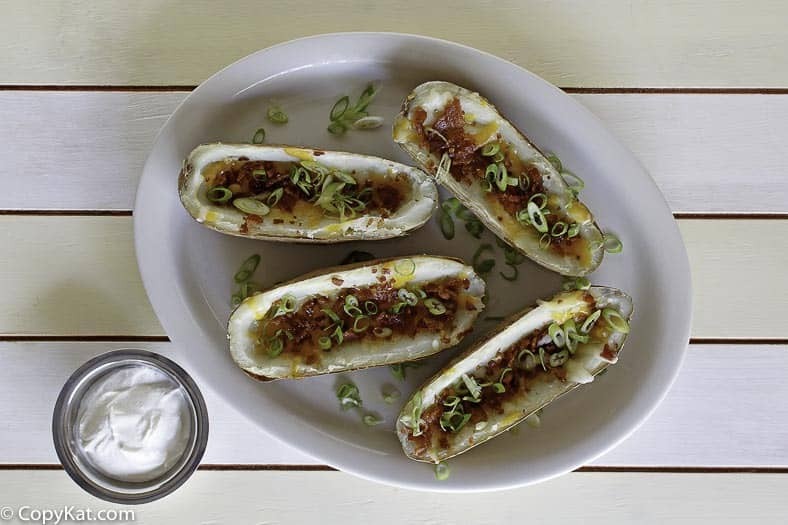 I can’t think of a better way to use up potato skins than to make these delightfully baked potato skins. Save the meat of the potatoes to make mashed potatoes or potato soup. The first TGI Friday’s was opened in New York City, in 1965 as a place where Allan Stillman, its owner, could meet women! Indeed, TGI Friday’s was among the first bars to promote Ladies’ Night, to attract more women in for less expensive drinks. And in case you were wondering, it was Stillman, along with an old college buddy, who later opened Tuesday’s, Wednesday’s, Thursday’s and Ice Cream Sunday’s. Do you love serving up the perfect game day food? TGI Fridays Potato Skins are so easy to make, and they are perfect for a party, game watching, or a fun appetizer for your whole family. These are so inexpensive to make, so they are perfect for a large crowd. Do you love serving delicious, easy game day food? TGI Friday’s Potato Skins are easy to make and are a popular dish for Sunday game watching, or for a fun appetizer with your otherwise routine, weekday dinner. 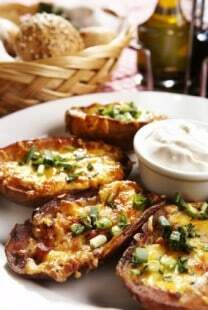 TGI Friday’s Potato Skins are also inexpensive to make, so they are perfect for a large crowd, game or no game. It’s amazing how easy it is to hack this recipe from TGI Friday’s. 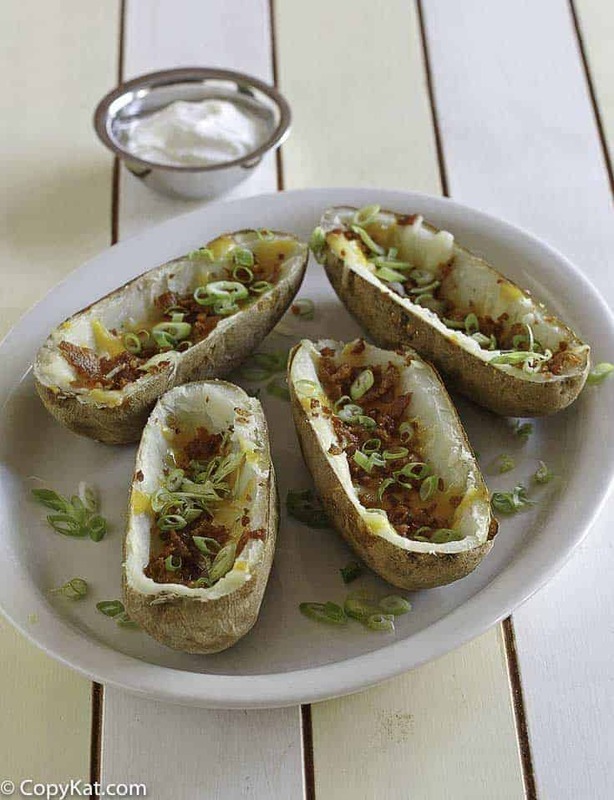 You will be a superstar when you recreate TGI Friday’s Baked Potato Skins at home. Start off with the right potato. With over 200 varieties of potatoes sold in the United States, its important to choose the potato that will yield the best results. Most chefs use Russet potatoes when making potato skins. Russets are the quintessential, Idaho, baking potato. Their high levels of starch make them perfect for baking and their slightly thicker skins can hold on to the toppings. These are the potatoes TGI Friday’s uses to make their potato skins. You don’t need to think you are going to be wasteful when making these potatoes. Do what restaurants do, you can reuse the meat of the potato for another dish. Did you know when you make these potatoes you can use the insides of the potatoes make Bennigans Garlic Mashed Potatoes? It doesn’t get much easier to make these potato skins. In fact, you may want to do some batch cooking and prepare extra baked potatoes one night, and then another night you can make potato skins. This is an appetizer recipe everyone loves. Potato skins are perfect for those who need a gluten-free treat. While they add cheese, green onions, and bacon to their potatoes, you could add other toppings like chili and some jalapeno peppers if you desired. One thing is for certain you are going to be amazed at how easy it is to hack a recipe from TGI Friday’s. 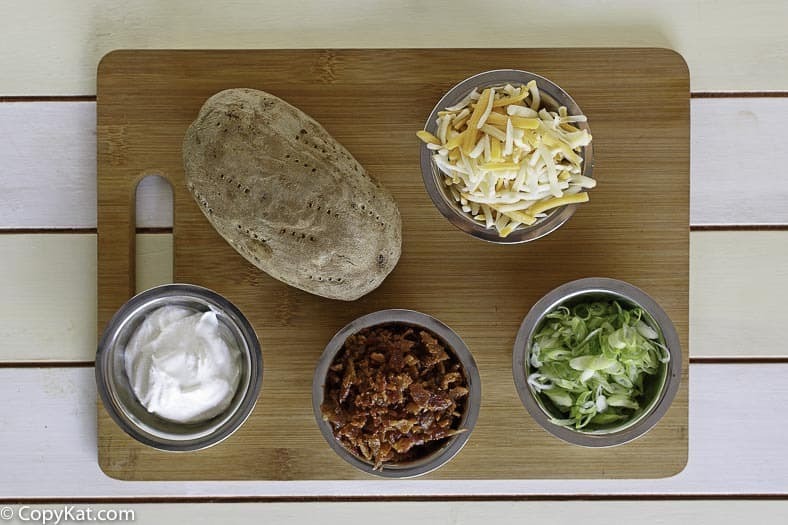 You can be the superstar at your home when you recreate TGI Friday’s Baked Potato Skins at home. Make TGI Fridays famous potato skins at home. Heat oven to 375 degrees. Brush potato shells with melted butter and sprinkle salt to taste. Bake for 15 to 20 minutes until crisp but not dry and hard. Remove and sprinkle with cheese, bacon and onion; place back in oven until cheese is melted. Serve with sour cream. For a bit of variety, try ranch dressing. thanks for the recipe! I love their skins! I worked in a rest. in the mid 80’s, the secret to really good pot. skins, fry the skins first. Place I worked used the ends of the prime rib, cheese, and broiled for a couple min. before serving. Never could eat better skins, I do my own, use left over steak. I bet frying the skins for the TGI Friday’s Baked Potato Skins does add a lot to the flavor and texture. I use my air fryer to save on fat.